The Greeks Pass Austerity, but Are They Being Priced Out of Their Lives? The man stood under a giant old tree on a grassy patch of Syntagma, the square across the street from Greece's Parliament. It was Wednesday morning, and commuters rushed by on their way to the subway. Most didn't notice him. The few who did saw that he was upset. He talked about drowning in debt. Minutes later, he put a gun to his head and pulled the trigger. The man, whom Greek media identified as Dimitris Christoulas, was a 77-year-old retired pharmacist with a wife and a daughter. Police found a handwritten note on his body. In it, he blamed the government for cutting his pension so much he could no longer survive on it. "I find no other solution than a dignified end before I start searching through the trash for food," the note said. His final act was an act of protest, too: He chose to die in the square that's become synonymous with the scores of anti-austerity demonstrations that have rocked Athens for the last two years. Giorgos Malikoutis was at his seaside suburban home when he heard the news. He's 65 and recently retired from his administrative job at Olympic Airlines. And he also has debts: He took out loans years ago to build small homes for his children. He was able to pay those debts until last year. That's when his pension got cut by 40% and also lost rental income from two buildings he owns. "So I went to the bank and asked for a haircut of 40 or 50%," he said, referencing the recent bond swap in which banks and other private creditors agreed to cut Greek debt by about half. The bank turned him down, he said, smiling bitterly. "The Greek government, who helped cause all this debt mess, can get a break," he said. "But I can't. I wonder if this man, this departed man, felt the same way." By Wednesday evening, Malikoutis was sitting on a bench in Syntagma, sipping a paper cup of grainy Greek coffee. He had come to pay his respects. So had hundreds of other Greeks. 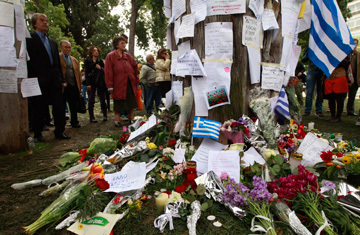 They encircled the tree where Christoulas had taken his life. They left bouquets of roses, tulips and gardenias. They burned incense and candles. "When I heard the news this morning, I immediately thought of Tunisia," said one mourner, a man in his 50s who gave his name as Michalis and said he worked in nutrition science. He was referring to Mohamed Bouazizi, the 26-year-old street vendor who set himself on fire in the Tunisian town of Sidi Bouzid last year, sparking the Arab Spring revolutions. Michalis wondered what the death of A retired Greek pharmacist would mean in a country paralyzed by fear, debt and uncertainty. He watched as mourners pinned sympathy notes to the trunk of the tree. Some notes were tinged with sadness, saying that he didn't die in vain. Some were angry, beseeching Greeks to take up arms against the government. A few people in the crowd broke into spontaneous chants. "This was not a suicide!" they yelled. "It was a state-perpetrated murder!" Later, the protest turned violent. Young men in hoods threw Molotov cocktails at riot police, who responded with tear gas. Many anti-austerity protesters blame the debt crisis on Greek politicians, whom they call traitors and thieves. Politicians here are so hated these days that many cannot walk in public without being pelted with yogurt and eggs. Greeks say politicians also sold out the country to international lenders in exchange for billions of dollars in bailout loans. Those lenders  the European Union and the International Monetary Fund  have forced the government to adopt very painful austerity measures, including wage and pension cuts and tax hikes, to bring down Greece's deficit. But the measures have also stalled the economy, dragging it into a fifth year of recession. Unemployment is now at 21%, more than double what it was two years ago, and the number of unemployed Greeks between the ages of 15 and 24 has surpassed an incredible 51%. "You've heard it before, but young people do not see a future," says Mary Nassi, who's 20 years old and studying architecture at the University of Athens. "It's so depressing and disappointing." She was also at Syntagma on Wednesday evening with her friend, Chryssanthi Mourti, also 20 and an architecture student. Mourti's parents lost their jobs several months ago. "My family has no income," she said. "Nothing." Mourti says she hopes Greece will get on a better path after parliamentary elections on May 6. But public polls show the vote will likely be inconclusive  no party has enough support to form a government on its own. Economists have also predicted more years of recession. The bailout agreements signed by the leaders of the main political parties mean that Greece must stick to a strict budget to keep receiving the loans that are keeping it from a chaotic default and a possible exit from the euro zone. But many Greeks say the E.U. and IMF care more about getting their money than what the austerity policies are doing to people. Some are especially angry at Germany, likening their insistence on austerity to an occupation. In his suicide note, Christoulas reportedly compared caretaker Prime Minister Lucas Papademos to Georgios Tsolakoglou, the Premier who collaborated with the Nazis during World War II. Greek media are filled with stories of people sitting in cold, dark homes because they can't pay their electricity bills  or people losing their homes altogether. UNICEF recently cited reports of children fainting from hunger in Greek schools. "This isn't an economic crisis, it's a catastrophe," says Aris Violatzis, a psychologist at Klimaka, a social services NGO in Athens. "People don't know how to break out of the isolation." Government data shows that the number of suicides in Greece has risen by at least 40% since 2009. Violatzis says he's seen a 10-fold increase in the number of calls to Klimaka's suicide-prevention hotline since 2010, when the debt crisis began. "The sad thing is that nothing new happened yesterday," he says. "It just happened at a particular place, Syntagma. People were committing suicides the day before yesterday and they will continue to do so the day after that." Though some of the mourners wondered if Christoulas' public suicide in such a symbolic place would galvanize the anti-austerity movement, Mary Nassi, the architecture student, was skeptical. Most people are too scared to take to the streets, she said. "The truth is, even those of us who choose to fight feel depressed," she added. Near the tree where Christoulas took his life, a few angry, hooded young men punched into the air and called the government murderers, but most people were somber and sad. "It's a pity," said a woman in her sixties, wiping away tears. "A pity." See "Why the Greek Bailout Doesn't Change Much of Anything." See photos of Greece's general strike turned to antiausterity protests.